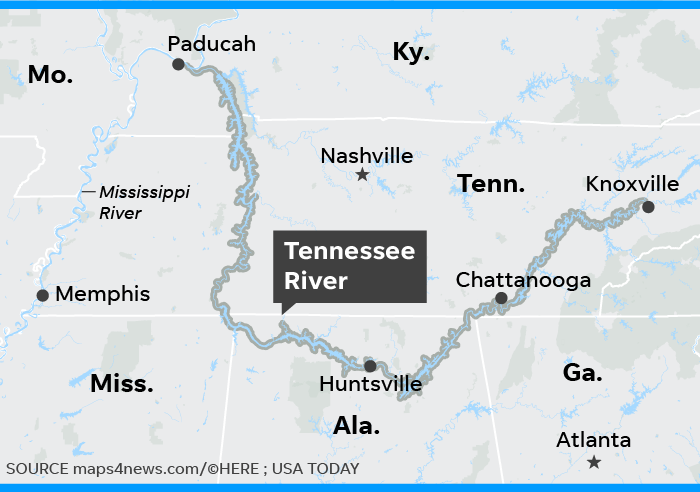 A new report following the 34-day swim of the Tennessee River found that its microplastic levels measured worse than rivers in China and Europe. KNOXVILLE, Tenn. — Microplastics, or tiny pieces of various types of plastic less than 5 millimeters long, have long been accumulating in sources of freshwater and the world’s oceans, and a new report following a 34-day swim of the Tennessee River found it is among the most plastic-polluted rivers in the world. While differing methods of measuring and reporting make direct comparisons a challenge, according to geology and hydrology professor Dr. Martin Knoll of the University of the South in Sewanee, microplastic levels in the Tennessee River are among the highest ever measured. Dr. Andreas Fath, who spent 34 days last summer swimming the 652 miles of the Tennessee River from Knoxville to Paducah, Kentucky, and his team analyzed three samples of the 12 they collected and found close to 18,000 microplastic particles per cubic meter of water in the Tennessee River. The finding was so surprising that the researchers double- and triple-checked the results, but the outcomes were the same. Compared to Europe’s Rhine River, which Fath swam and analyzed in 2014, the Tennessee River shows a dramatic contrast both in terms of microplastic levels and human population in the rivers’ respective watersheds. Some 5 million people live in the watershed of the Tennessee River, according to a working report co-authored by Fath and Knoll, among others, compared to around 56 million people living in the Rhine’s watershed. Despite an order of magnitude’s difference between the two populations, Fath found that microplastic levels in the Rhine amounted to just 200 particles per cubic meter, meaning that levels in the Tennessee River were some 80 times higher. A 2017 study of China’s Yangtze River, which provides water for hundreds of millions of people living within its river basin, found that microplastic levels in the Yangtze reached nearly 9,000 particles per cubic meter, about half the levels found in the Tennessee. Knoll explained that the 2017 study only included particles between 50 and 500 micrometers, as opposed to using the 25 to 500 micrometer range that Fath used on the Rhine and Tennessee, making the results harder to compare. Still, he said it could be theorized that, because smaller particles are more numerous, the Yangtze’s levels would be about on par with the Tennessee’s when using identical methods. Nearly half of the microplastic particles found in the Tennessee River were made of polyethylene, according to Knoll and Fath’s findings, which is frequently used to make different varieties of plastic bags. Forty-eight percent of particles found in the study were identified as polyethylene, while another 16.8 percent were determined to be polypropylene, which is frequently used to make plastic packaging. Knoll said the near-uniform levels of microplastics found across the span of the Tennessee River was an indication that the particles were not coming from a single source, and he suggested plastic pollution was more likely the issue. More: What would happen if everyone recycled? The overwhelming abundance of microplastics in the Tennessee River is likely to have an effect on the variety of freshwater wildlife that calls the river home, Knoll said, but the scale and specifics of that impact is largely unknown. Studies on microplastic levels impacting oceanic wildlife have shown that particles frequently accumulate in the gills and stomachs of fish and that pollutants in the water can easily bind to the particles, creating what Knoll called a “chemical bomb” that could then be ingested. Dr. Anna George, director of the Tennessee Aquarium’s Conservation Institute, said the effects of microplastics on freshwater marine life are broadly understudied compared to its effects on ocean life. “There also isn’t as much studied on the impacts of microplastics on river wildlife as compared to ocean wildlife, but we would expect to see similar problems. Most of the concerns relate to animals ingesting the microplastics,” George wrote in an email to the News Sentinel. The first step toward lowering microplastic levels is reducing plastic consumption locally, George said. To help make that happen, the Tennessee Aquarium in Chattanooga is promoting awareness of ways to reduce plastic consumption through the aquarium’s In Our Hands pledge. Local water treatment services also provide an opportunity for communities to keep microplastics out of their water supplies by removing them from water before and after public use. Chris Thomas and Kevin Keaton, manager and assistant manager of Safety and Regulatory Services at KUB, which is Knox County’s largest water services provider, said KUB’s treatment plants have to meet strict criteria for solids removal, but that the EPA and the Tennessee Department of Environment and Conservation don’t have specific guidance or regulations for sampling or analyzing microplastic levels. “I would think that we’re achieving reduction of solids and (microplastics) being in there, but without any methods characterized by the EPA to be able to sample for microplastics and analyze microplastics, there’s no ways for us to really quantify that,” Thomas said. “It’s hard to know what in the treatment process is tied to exactly to what trends with microplastics," Thomas said. "It’s so new and there’s so much research that’s needed on it."